Operating in the realms of the lowest male weight division inside the Octagon, what Demetrious Johnson accomplishes at each passing title defence doesn't often get full credit. But when playing second fiddle to the return of one of the greatest fighters of all time in Jon Jones, the Flyweight king arguably upstaged him. 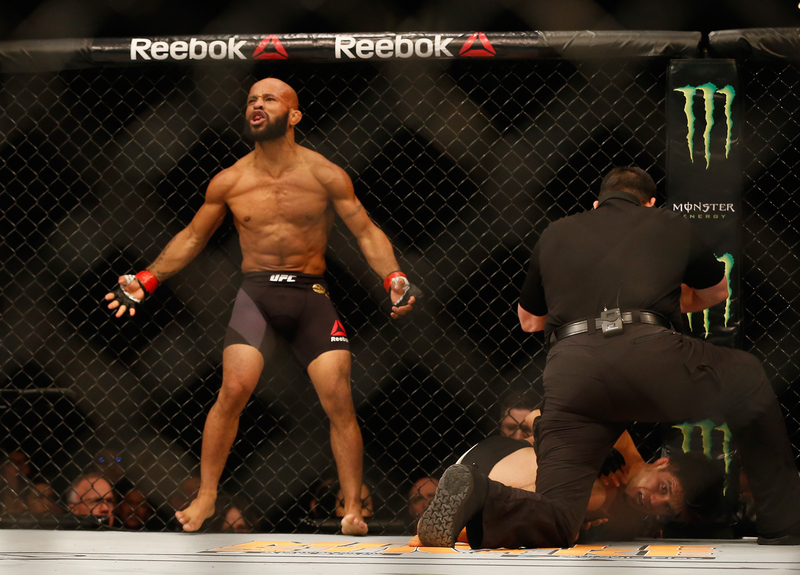 "Mighty Mouse" demolished Henry Cejudo with some lethal knees inside one round to make his eighth defence of the Flyweight Championship, part of a blistering run since September 2012. In a sport where world championships switch hands rapidly, he possesses the longest active title reign. Robbie Lawler, the runner up in the category, is 2 years behind. It just goes to show that however much fighters evolve in different disciplines around the cage, Demetrious is a few steps ahead. Henry Cejudo became another exhibit of a showcase of talents on the part of the Flyweight champion, in other times he has submitted opponents at ease or simply outclassed them wherever the fight goes. Placing both Jon Jones and Demetrious Johnson on the same card was the perfect platform to fuel a debate that is perhaps more straight forward than first thought. Ring rust may have contributed to the Light Heavyweight's subdued performance, possibly the change in opponent too, but its very rare you find the Flyweight on a bad night - his injuries are just as uncommon. He has trail blazed a path to become the fighter of the future, by obliterating fighters of now. Smarter training methods and excelling in all techniques is back to the true core of mixed martial arts. Perhaps he is inadvertently at fault for all the criticism the division has - since he's the one making the most perennial of contenders look well below average. Channelling the inner Joe Rogan - he's just "the best." Let's leave it down to the organizations colour commentator to continue hurling the superlatives at Johnson, but regardless they are justified. Every time Demetrious has stepped into the cage he has excelled, and he just keeps on getting better. The draw with McCall and close scrap with Dodson were at an early stage of his dominance, he may just continue to get better and better. It also goes to show how much size means and is interpreted in combat sports. The well documented McGregor saga brought them into question with his 25 lbs jump in a loss to Nate Diaz, but at Bantamweight for Johnson, the story wasn't so similar. While he remained at a world class level, his evolution was most likely stagnated with the conditions of being almost dwarfed against the likes of Dominick Cruz, who took advantage of the size discrepancy to dominate on the mat. Interpretation of smaller fighters is perhaps why Johnson isn't as paraded as the rest of the UFC's champions. It looks like the general consensus of the past still looms, ironically, large: the money is on the bigger fighters. Even though Featherweights have came into the bracket of marketable fight athletes, helped on with Floyd Mayweather and others progressing in boxing, Flyweight just seems a little too small to embrace any sense of danger or intrigue - which is what sells tickets. The UFC didn't plan on having him headline UFC 186 and 191, but due to the main events being called off for injuries or scheduling reasons, he was forced to step up. Undoubtedly, it was a financial blow, but for the finer spectators of the industry, he put on a five round clinic - finishing one with an armbar with a second to spare, and the other a concrete decision. So when the organization came knocking again with a co-main event spot which stayed in tact, Johnson was in an optimum place. He didn't have to worry about carrying the show, he simply showed up, got taken down, then got back up, and landed some painful knees in the clinch before ground-and-pound to retain his championship. He was on most people's minds when the night ended - and that's a good thing. At this current moment, history lies on the agenda. Anderson Silva's record breaking 10 title defences spanning from 2007 to 2012 is something Johnson has his eyes on. Three more wins and he would have broke the record, which looks like an easy ask now considering the circumstances and how thoroughly he has cleaned out this division. Those who want to see the big fights are more than entitled to request Johnson to fight Cruz again at Bantamweight, but the Flyweight champion has every right to continue tearing through the competition. And it looks like that is exactly what he's going to do. No matter how many sensational performances he will deliver, for a wider audience Demetrious Johnson just may never catch on. He may not be a draw, but he is currently the best fighter on Earth. Someone may never be able to take that away from him.